Canon has released a firmware upgrade which adds editing controls to the 7D 'semi-pro' DSLR. A number of other new features have been added via the firmware upgrade, including a higher maximum raw shooting burst rate, user-definable Auto ISO and support for the latest GPS receiver. Launched back in 2009, the 7D sits at the top of Canon's APS-C camera line-up. It features an 18 million pixel sensor, dual Digic 4 processors and a maximum ISO of 12,800. Up to 8fps shooting is available. The new upgrade boosts the maximum raw shooting buffer to a new high of 25 raw files or 130 JPEGs. Newly added editing features include the ability to process raw files and correct aspects such as peripheral illumination, distortion and chromatic aberration. Adjustments to white balance, sharpness and Picture Style can also be made, among other parameters. Edited photos will be saved as new JPEGs on the camera, while in-camera cropping (of JPEGs) is also available. An image rating facility, which has proven popular on other models in Canon's range has also been introduced. Image rating data is stored in the metadata of a file, which can then be read by a range of editing software, including Canon's own Digital Photo Professional and Adobe Lightroom. Extended Auto ISO control now allows for the photographer to set any point within ISO 400-6,400 as the maximum cap to suit personal preferences. 16 bit digital stereo sound, sampled at broadcast-quality 48KHz, and a new manual control of audio levels complements full HD video recording. A digital wind-cut filter also reduces noise made by movement of air around the microphone. The new firmware also enables the 7D to be used with the new GPS receiver GP-E2, which can be attached to the camera's hotshoe for geotagging photos. Other upgrades include file name customisation, faster scrolling of magnified images and time zone settings. 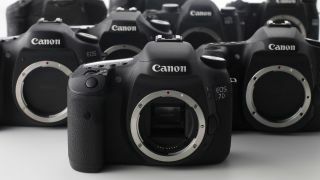 The Canon 7D firmware v2 will be available to download from August 2012.